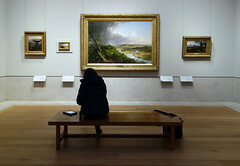 During the nineteenth century—an expanse of time that saw the elevation of landscape painting to a point of national pride—Thomas Cole reigned supreme as the undisputed leader of the Hudson River School of landscape painters (not an actual school, but a group of New York city-based landscape painters). It is ironic, however, that the person who most embodies the beauty and grandeur of the American wilderness during the first half of the nineteenth century was not originally from the United States, but was instead born and lived the first seventeen years of his life in Great Britain. Originally from Bolton-le-Moor in Lancashire (England), the Cole family immigrated to the United States in 1818, first settling in Philadelphia before eventually moving to Steubenville, Ohio, a locale then on the edge of wilderness of the American west. Cole worked briefly in Ohio as an itinerant portraitist, but returned to Philadelphia in 1823 at the age of 22 to pursue art instruction that was then unavailable in Ohio. Two years later, Cole moved to New York City where he exchanged his aspirations of painting large-scale historical compositions for the more reasonable artistic goal of completing landscapes. 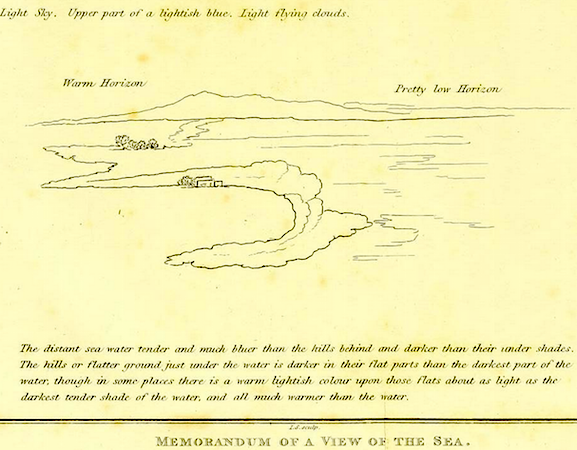 For instruction, Cole turned to a book, William Oram’s Precepts and Observations on the Art of Colouring in Landscaping (1810), an instructional text that had a profound effect on Cole for the remainder of his artistic career. Cole found quick success in New York City. 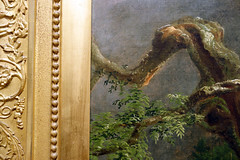 In the year of his arrival, 1825, John Trumbull, the patriarch of American portraiture and history painting, and the president of the American Academy of Design “discovered” Cole, and the older artist made it an immediate goal to promote the talented landscape painter. In the months to follow, Trumbull introduced Cole to many of the wealthy and prominent men who would become his most influential patrons in the decades to follow. One such man was Luman Reed, an affluent merchant who, in 1836, commissioned Cole to paint the five-canvas series The Course of Empire. 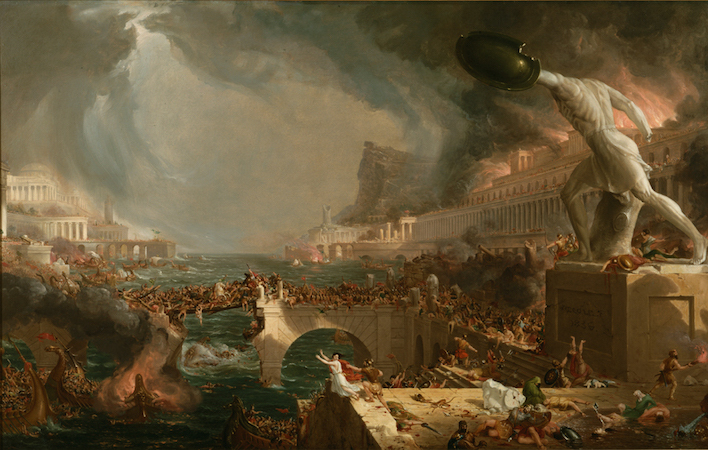 It is in this series—and in many of the paintings to follow—that Thomas Cole found the aesthetic voice to lift the genre of landscape painting to a level that approached history painting. During the eighteenth and nineteenth centuries, great artists aspired to complete large-scale historical compositions, paintings that often had an instructive moral message. Landscape paintings, in contrast, were often though more imitative than innovative. 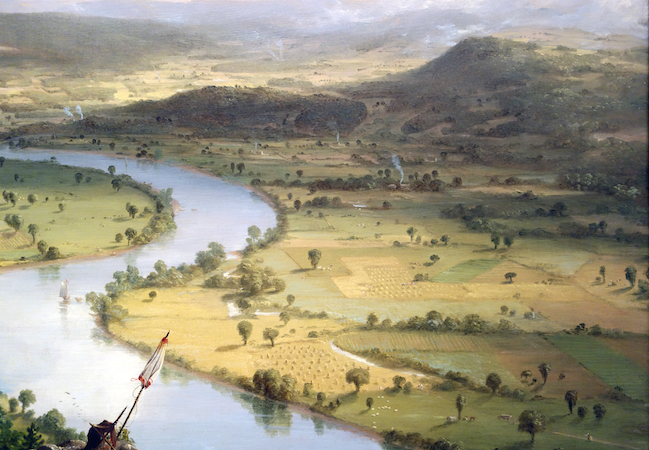 But in The Course of Empire, Cole was able to take the American landscape and imbue it with a moral message, as was often found in history paintings. 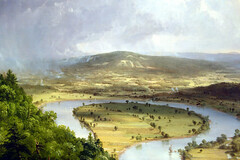 Indeed, the landscapes Cole began to paint in the 1830s were not entirely about the land. 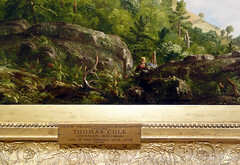 In these works, Cole used the land as a way to say something important about the United States. 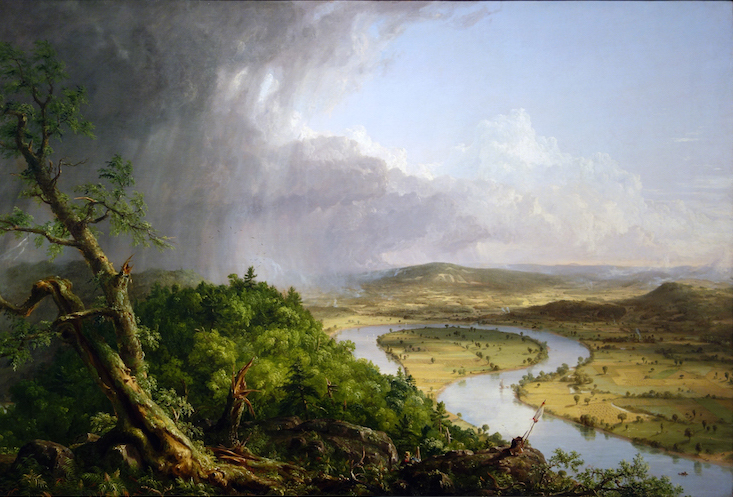 A wonderful illustration of this is Cole’s 1836 masterwork, A View from Mount Holyoke, Northampton, Massachusetts, after a Thunderstorm, a painting that is generally (and mercifully) known as The Oxbow. 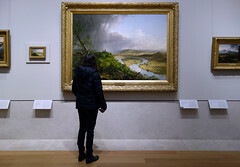 At first glance this painting may seem to be nothing more than an interesting view of a recognizable bend in the Connecticut River. But when viewed through the lens of nineteenth-century political ideology, this painting eloquently speaks about the widely discussed topic of westward expansion. 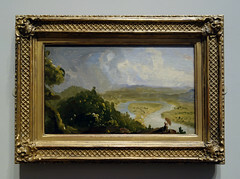 When looking at The Oxbow, the viewer can clearly see that Cole used a diagonal line from the lower right to the upper left to divide the composition into two unequal halves. The left-hand side of the painting depicts a sublime view of the land, a perspective that elicits feelings of danger and even fear. This is enhanced by the gloomy storm clouds that seem to pummel the not-too-distant middle ground with rain. 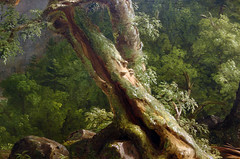 This part of the painting depicts a virginal landscape, nature created by God and untouched by man. It is wild, unruly, and untamed. 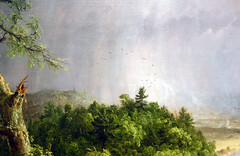 Within the construction of American landscape painting, American artists often visually represented the notion of the untamed wilderness through the “Blasted Tree, a motif Cole paints into the lower left corner. That such a formidable tree could be obliterated in such a way suggests the herculean power of Nature. If the left side of this painting is sublime in tenor, on the right side of the composition we can observe a peaceful, pastoral landscape that humankind has subjugated to their will. The land, which was once as disorderly as that on the left side of the painting, has now been overtaken by the order and regulation of agriculture. Animals graze. Crops grow. Smoke billows from chimneys. Boats sail upon the river. What was once wild has been tamed. 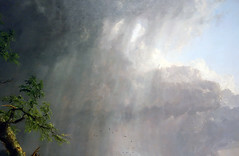 The thunderstorm, which threatens the left side of the painting, has left the land on the right refreshed and no worse for the wear. The sun shines brightly, filling the right side of the painting with the golden glow of a fresh afternoon. 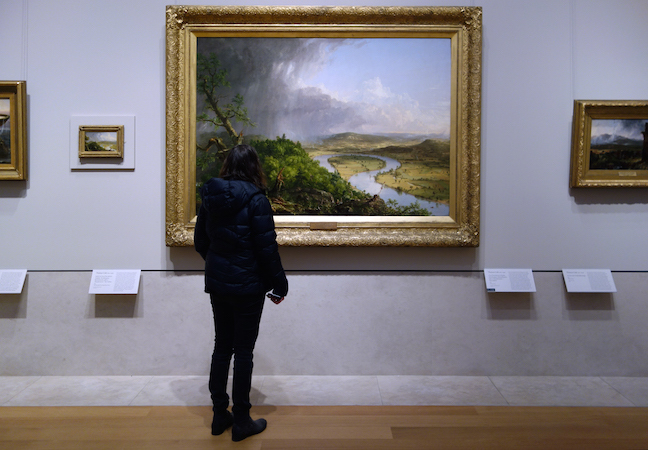 When viewed together, the right side of the painting—the view to the east—and that of the left—the west—clearly speak to the ideology of Manifest Destiny. During the nineteenth century, discussions of westward expansion dominated political discourse. The Louisiana Purchase of 1804 essentially doubled the size of the United States, and many believed that it was a divinely ordained obligation of Americans to settle this westward territory. In The Oxbow, Cole visually shows the benefits of this process. The land to the east is ordered, productive, and useful. In contrast, the land to the west remains unbridled. Further westward expansion—a change that is destined to happen—is shown to positively alter the land. 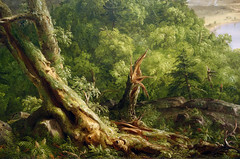 Although Cole was the most influential landscape artist of the first half of the nineteenth century, he was not completely adverse to figure painting. 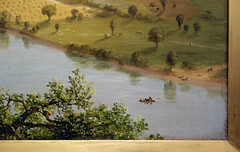 Indeed, a close look at The Oxbow, reveals an easily overlooked self-portrait in the lower part of the painting. Cole wears a coat and hat and stands before a stretched canvas placed on an easel, paintbrush in hand. The artist pauses, as if in the middle of the brushstroke, to engage the viewer. 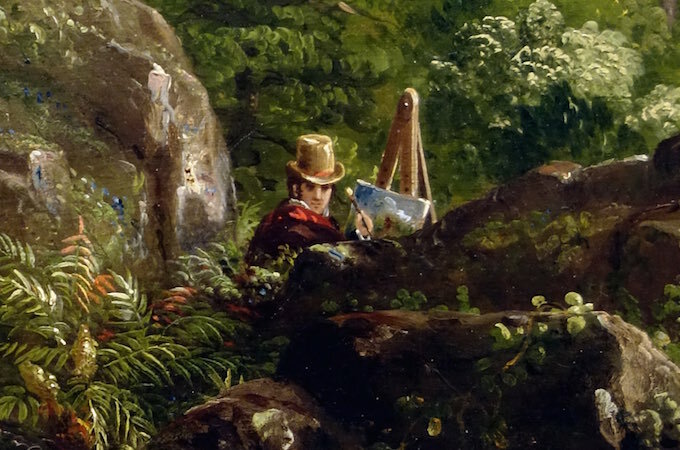 This work, then, in a kind of “artist in his studio” self-portrait—is akin, in many ways, to Charles Willson Peale’s 1822 work The Artist in His Museum. In each, the artist depicts himself in his own setting. 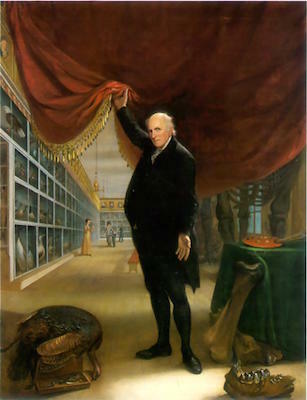 For Peale, this was his natural history museum in Philadelphia. For Cole, this was the nature he is most well known for painting. 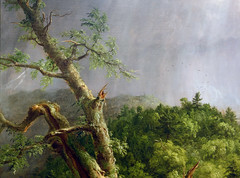 Although he only formally accepted one pupil for instruction—this was, of course, Frederic Edwin Church—Thomas Cole exerted a powerful influence on the course of landscape painting in the United States during the nineteenth century. 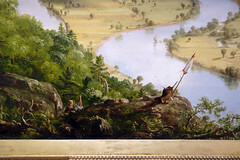 Not content to merely paint the land, Cole elevated the landscape genre to approach the status of historical painting. 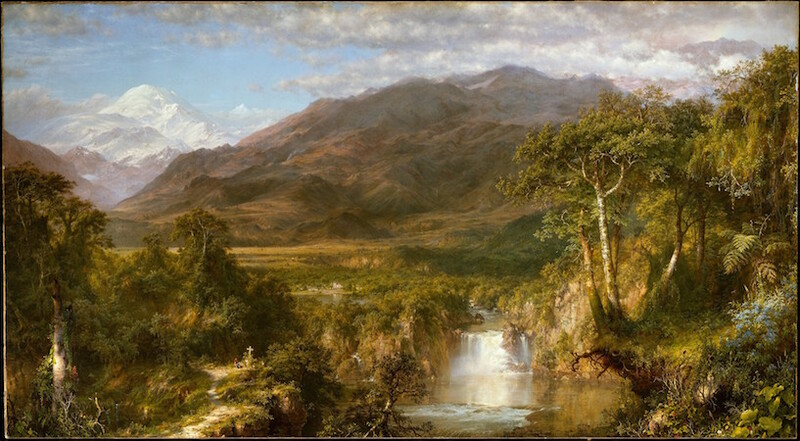 The landscape painters who followed during the middle of the nineteenth century—Church, Durand, Bierstadt, and others—would often follow the trail that Cole had blazed. Cite this page as: Dr. Bryan Zygmont, "Thomas Cole, The Oxbow," in Smarthistory, August 9, 2015, accessed April 22, 2019, https://smarthistory.org/cole-the-oxbow/.